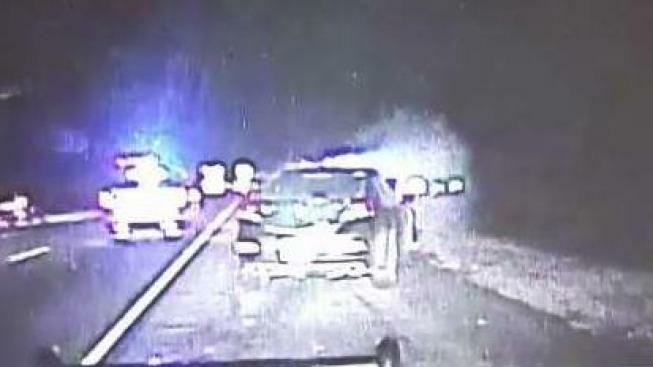 Connecticut State Police say a trooper was working a detail when a car veered off the highway and struck his unmanned police cruiser. A driver faces numerous charges after his car swerved into a parked Connecticut State Police cruiser on I-91 early Sunday morning, police said. Police charged Martin Jackson, 29, with driving under the influence, driving with a suspended license, and failure to drive in his lane following the 5 a.m. crash. The trooper was not in the vehicle at the time and Jackson received minor injuries. Police report that the trooper was at the scene investigating an earlier crash near Exit 21. Police said Jackson apparently lost control after he swerved around one cruiser and then drove into the SUV. Police used the incident to remind other drivers of the Move Over Law, which requires motorists to slow down and move over when in the area of emergency vehicles.